Color management can be a confusing issue. Especially if you are new to working with a digital workflow and are just getting started in photography. When I first started setting up a workstation and scrutinizing the color of my images, the first thing that became very apparent was something was way out of whack. I would scan my slides through my slide scanner(when still shooting film) and look to my monitor to see something that resembled my image in composition, but not even close in color. The first thing that needs to be understood when setting up a properly calibrated color management system is that you are dealing with multiple devices that interpret color all in their own way. So you are dealing with variables. When we think of it in terms of each device interpreting color in its own way and that each device must be calibrated or told information about what we are doing, this makes it a little easier to understand. So once we can get a grasp on that, then we need to learn something about color space. When working in a digital environment, there are only so many colors your monitor can display and only so many colors that can be represented in a print. So what we do is we assign a color space to our workspace and this defines a specific color gamut that can be shown to us on screen and that will be represented in output. Some color gamuts can be quite large, others small. If you are sending your images to the Internet, it is usually recommended to have your images in a SRGB color space, because this holds a smaller gamut that can be easily displayed on most monitors. When you have a monitor designed for image editing, it usually can display a wide range of color so you may want to have a color space defined such as AdobeRGB(1998). This profile allows a much wider range of color. So as you can see already even with monitors we are dealing with some that are capable of displaying a wide gamut, others that are not. The standard workspace for most photographers now is Adobe1998, so that’s what we’ll be using when setting up Photoshop to define our color space. So now that you have your monitor setup and Photoshop installed and your new photo-printer ready to go, where do you begin? The first thing we need to do is calibrate our monitor. We need to make sure that the monitor is going to display your images with accurate colors so we will want to create a profile for it. So you need to buy a calibration device that attaches to your monitor and can configure it. I use the SpyderPro. But there are a handful of others such as Pantone and Xrite that all make very good calibrators. Do some research and see what fits your needs and budget. So now that we have properly calibrated our monitor to display colors in the correct manner, we now need to tell Photoshop how to display our colors. This is easy, just go into your menu and select edit, color settings and then under working space where is says RGB, we are going to select Adobe RGB(1998). Now we have told Photoshop how we would like our color represented. Or if you picture it this way: Photoshop knows what monitor profile is loaded after you calibrate it and so it will use that information to display colors under the workspace setting you have just set. So in a sense each device whether it’s Monitor or software needs to be talking to each other so they can all agree on how your colors will be. Confused yet? Good. So we at least have our workspace set up, now what about if you are using a scanner to scan in slides? Well you’ll notice if you dig through your scanner’s software settings it usually will have options for setting colorspace and monitor profile. So you would select Adobe RGB (1998) for colorspace and whatever the name of your monitor profile is after your calibration device and software created one. Now we throw the printer into the mix and this is where most people have problems, because you are going to be holding in your hands visual proof of the image you just edited and this is the ultimate test to see if you workflow can print what you see on screen. Here we deal with a few variables, but I will go through the basic settings. I use Epson printers for my printing, but most others will have very similar interfaces in their printer dialog menu. 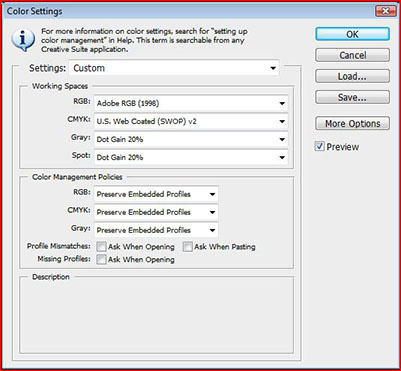 The first thing you want to check is that under color handling in your print dialog box it is set to have Photoshop handle the colors, not the printer. Next you have to specify a printer profile. Under printer profile simply select your model of printer. This should have been installed when your printer software is loaded. Next you’re going to select page setup and then select your paper. Here you want to be specific and I know most new printers will have paper profiles at least the basic ones loaded on here. So if you’re using premium luster paper, select premium luster paper from the drop down list. If you get into using custom papers then you will need to find and download those specific profiles. Again for every variable in this color management system (even the paper) we need to tell our software what we are using. So the last step will be to select advanced in the printer dialog box. Select ICM and then check the box that says OFF(no color adjustment). We are doing this because we have already told Photoshop to manage the colors and if the printer is trying to do the same thing at the same time you will have some funky stuff going on. So in a very limited nutshell that is how a basic color management work-flow is set up. If you want to learn more about the technical side of it, I would suggest getting any one of Bruce Frasier’s books on Photoshop or more specifically color management. He was an excellent teacher in this field and his Book Real World Color Management would do well to get you on your way to proper color and help restore your sanity. I know it did mine. Hopefully you are on your way to a better workflow and getting closer to matching those colors up.